So, today MCeezy and I got our wish of landing Carson Palmer on the Raiders. You never can tell what you’re getting until you see him play, but overall it’s hard to dislike the move as a Raiders fan. I’ve already heard some say he might flop because his last few years weren’t all that great, but then again when he was in Cincy, and his RB’s to help shoulder the offensive load there were Rudi Johnson, Chris Perry, and Cedric Benson (Not exactly an All-Pro list). I’m sure DMac will help him get some easy one on one situations on the outside, and he can’t throw the deep ball any worse than Campbell did, so all signs point to it being a good acquisition. I had to write a little about it even if it doesn’t have to do with the video, since obviously it’s the Raiders. When I’m Wrong I Say I’m Wrong…. A little while back I expressed my disdain over the Denver sentiment that Tim Tebow should be their starting quarterback. I understood their desire to see their entertaining young player make some plays on the field, but at the same time, I knew Kyle Orton was the safe bet to run the Broncos’ offense. This past weekend, since the 49ers were blowing out the Buccaneers, I caught a good majority of the Denver-San Diego game, and in the second half, it was clear that it was Tebow time. Down 16, Tebow made an immediate impact when called upon. All would agree that Tebow can make plays with his feet, but most would argue that that’s not a recipe for success in the NFL. I too knew Tebow could scramble with the best of em, but his arm actually impressed me in the extended time I got to see him play. After he scored a TD on his first drive with his legs, Tebow made an amazing throw on the two-point conversion attempt to Brandon Lloyd. Even though commentator Rich Gannon was able to pick Tebow’s fundamentals apart, I thought it was a perfect throw. Lloyd was nearly able to pull it in, and much credit has to be given to the defender for breaking it up. Even though Knowshon Moreno was primarily responsible for the Broncos’ next score, Timmy T led another solid drive downfield. Tebow also made some solid throws on the failed attempt to tie the game though time expired on Denver’s final drive. The bottom line is, Tim Tebow gives the Broncos just as much of a chance to win as Kyle Orton did, but brings a lot more potential for amazingness. So for that, I eat my words. I warned Denver fans to be careful what they wished for, but now I’m on board. It’s kind of like Occupy Wall Street. At first I was skeptical, but now that I see the possibilities, I’m on board. Consider me a part of Occupy Mile High. I really don’t get the Coup d’eTebow going on out in Denver. Well, I do, but I don’t get how some fans can be so disillusioned to think that replacing Kyle Orton with Tim Tebow would turn the Broncos around. I wasn’t going to chime in when the fans were already chanting Te-bow in the season opener, but now I hear some wealthier fans are actually taking up billboards. I don’t think the Broncos front office is trying to keep Tebow off the field. All the chatter at the beginning of training camp was that he would be the starter. Then he fell to number 2, then to 2B, next to Brady Quinn. Clearly Tebow played his way off the field. Surely the front office would LOVE to put their most marketable player out their on the field. Shoot, if he played even with Kyle Orton, they’d probably give him the nod. Obviously, playing Tebow is simply not a good football decision. It’d be like out here in Sacramento, if the NBA season ever starts, and the Kings weren’t playing Jimmer Fredette (which won’t happen). Fans would react the same, EXCEPT, they’d be smart enough NOT to call for him to play over Tyreke Evans. Fortunately in basketball it’s different and they can play together. I got quite a heavy dose of Kyle Orton this past week, since the Broncos were opening the season against the Oakland Raiders. True, he can leave a little to be desired at times, but what I kept thinking to myself – especially in the second half, when the Te-Bow chants ridiculously started chiming on from the Mile High Crowd – was, would Tebow be making the plays that Orton isn’t? Not once did I say yes. The bad throws by Orton, I couldn’t see Tebow threading the needle any better. And even though Orton was sacked five times, Tebow, despite his well-documented scrambling skills, would not have evaded ANY of them. It’s not as though Orton was dancing around in the pocket getting chased down by 300 pounders. The Raiders defensive line (which I’m going to start calling the best in the NFL pretty soon) was simply bullrushing through the Broncos’ offensive line. Orton didn’t even have time to SEE them. What’s Tebow going to do in that situation?! I guess Denver fans want to find out. One day they probably will, and that’ll be the day the Tebow billboards will come down. Let’s just hope there’s a good-humored fan out there who’ll have the cash to replace it with a “IN with Quinn” billboard. Alright…. this has gone too far. It’s gone too far, and we’re not even to the NBC Sunday night game. But this Matt Dodge kid is getting thrown under the bus pretty hard today. At some point during both Jets-Steelers and Raiders-Broncos, the CBS coverage crews were dumping on him pretty hard. Now, ESPN Sportsnation is getting a few kicks in with their latest poll. Who do you blame more, the Giants defense or MATT DODGE? Do we really believe he was told deliberately not to punt to Desean Jackson, and he just munsoned it? I’ve got to give him more credit than that. This one’s on the coaches if you ask me. In every operation, you’ve got people in charge of making decisions, and it’s their job to put certain people in the right situations. If you’re getting paid to run the show, then you should probably make a point to make sure your punter knows to not punt to Jackson. It’s just a simple lack of preparation. We all do it, but damn, they’re really letting this kid take the fall for it this time. Just because he’s the league leader in blocked punts doesn’t mean he’s an idiot. Not sure why I’m defending this guy – I’d never even heard of him before today. The Legend of Michael Vick just grew a whole nother chapter though….. Which makes me want to weigh in, for the first time really, on Michael Vick. Chris Berman said (overdramatically) that players didn’t want to let Vick down. This is true because a lot of players could have been dragged down with him, but he basically took the fall for the whole league. He didn’t run a dogfighting ring; he bred dogs. He bred them and sold them to his colleagues. Naturally they wanted badass dogs that could fight and his business evolved. He made some costly decisions, but in the end, he took the fall for a lot of other people’s actions – and never threw anyone under the bus in the process. As a result, the majority of the NFL is going out their way to have his back in return for him having theirs. If there is a way for the Eagles to play in Atlanta against the Falcons in the playoffs, sign me up. That’s looking like the likely NFC Championship game right now. In West Coast news, Tim Tebow made his first NFL start – in Oakland. The most Christian player in the league has to make his debut in the Black Hole, with demons and skeletons everywhere. It brought a smile to my face last night when I heard the news he was getting the start. Much to my delight, the Raiders pulled away in the second half and came away with a 39-23 win. That’s a total of 98 points on the Broncos this year in two games. Shanahan would’ve never stood for this, but he’s got his own share of problems right now. As for the Raiders, they’ll host the Colts next week, in a game that’s unfortunately important for Indianapolis. Oakland is now 2 games back with two to play. The upside is that they’re really only one game back from a winner-take-all showdown in Kansas City. The possibility of the Chiefs losing to Tennessee just got a little more promising today with the Titans showing signs of life and beating Houston. The Colts game is one the Raiders really have no business winning, but it makes the game worth watching, and those are two words I haven’t used to describe a Week 16 Raiders game in a long time. Tim Tebow hasn’t taken an NFL snap, and might not this whole season. I’m sure he’ll get in on some plays though kind of like his first year at Florida. The numbers on jersey sales came in from NFL’s website for the month of April, and Tebow was on top by a wide margin. I remember back when I saw Brady Quinn’s Right Guard commercial before he took a snap in the NFL, and it made me throw up a little. Mainly because these guys are already pulling in a ton of money from their ridiculous first round contracts and bonuses, then to top it all off they get a few extra million from advertising crap. Prove something to us before you start on the marketing campaigns. One thing I can draw from the sales, is that there are either a lot of religious people out there, or everyone in the state of Colorado and Florida decided to buy his jersey the second it was available. I’m still as skeptical as the next guy on how Tebow will play in the NFL, and I don’t think it will work. Not just because I’m a huge Raiders fan, and want project Timmay to fall flat on it’s face, but because I wouldn’t have felt comfortable with him if he was on the Raiders. That’s the main way I decide exactly how much I think a player has to succeed. Do I want him on my team? No, not really, unless Jamarcus was still our starter. It feels like he’s got just about everything going against him in the media, and the “experts” analysis, so that makes me think he will want to prove those doubters wrong. If there’s one thing I know he’s good at, that would be proving people wrong with God as his guide. There is some irony to him picking #15 as his number. You replace Brandon Marshall, a perennial headache off the field, and now have #15 representing Jesus part 2. I’m far from a college football expert, or could really even tell you much about many of the teams, but I am pretty pumped to see the obvious Bama and Gators match up, and one of my all time favorite rivalries the Civil War Oregon vs. Oregon State! MCeezy wrote about how rivalry week is somewhat deceiving, but these two games are about as heated as rivalries can get! Hopefully they will play out that way! Same with my NFL picks the home teams are in bold. I don’t think the Beavers will win this game, but Moevao has said that they are looking for revenge from last years upset. I didn’t feel it was a big upset last year, but what do I know! I feel they will pull out all the tricks they have in the playbook to keep this one close, and hopefully it ends up like 2007’s double OT battle. I understand that the Ducks are the more talented team, but in a rivalry anything can happen. Also besides the Beavers having to contain Lamichael James and Jeremiah Masoli they should see a small dose of Legarrette Blount in his first game back from the suspension. He should give them that big back to pound the football on the ground, which they haven’t had most of this season. MCeezy predicted he’d be back for their most important game, and it looks like he was right! I can’t figure out why this line is so high since the Beavers ARE at home, and ARE a good team! 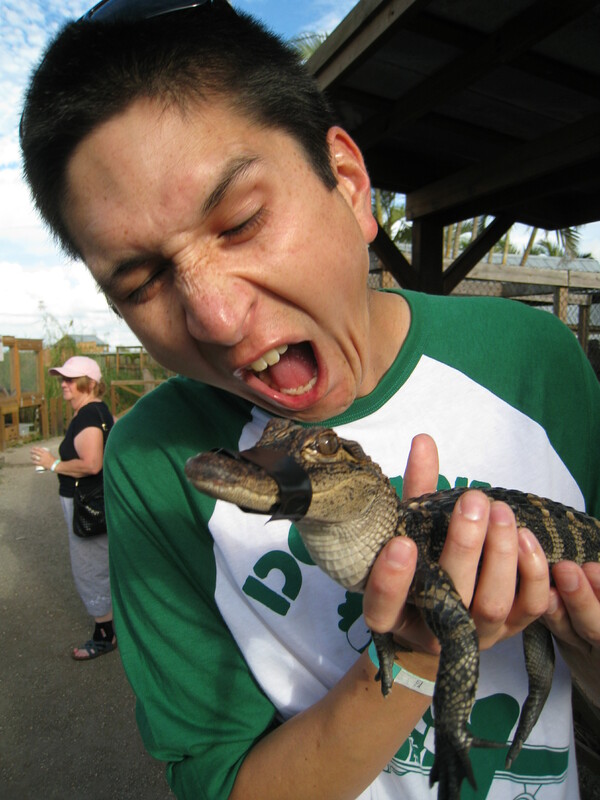 Me trying to curse the Gators by chomping on one! I guess I’m writing about this game because I was in Florida last week, and it seems like it was all I really heard about for most of the week! After hearing the hype over there I’ve decided to pick my second straight underdog! I think that in college football the home field makes much more of a difference than it does in the pros. I’m not confident that Bama can actually pull this one out, but since they are the #2 team in the country they deserve to be at least within a FG on the spread at home! Florida and their 22 straight wins will probably win this game, but I like many others love to see an upset. I don’t dislike Tebow especially since he has proven that he is an amazing leader, but i don’t have quite the same type of love as Sportsguyby has for him! Losing Dunlap to the DUI, should make it a little easier for Bama to move the ball, and should give them a little more time to throw. I see this one ending closer than last years SEC title game! The debate picking up steam in northern Florida, specifically Jacksonville-metro and all of Florida Gator territory, is the state of the Jaguar franchise and the timing of their native son entering the NFL. I use the word timing because at no time has the Jaguar’s franchise been in worse shape off the field, having lost over 17,000 season ticket holders over the past two seasons. Yet their collegiate counterpart has seen nothing but the greatest success winning multiple National Championships and compiling players that could probably run the Jags right off the field head-to-head (speed and talent wise, perhaps not the professional skill level of course). The unequivocal leader of this team the past four years has been The Christian Soldier, he who can do no wrong, Tim Tebow. He showed the nation something special his freshman year when he displayed pure heart and determination each time he touched the ball. He gave up his body and ego all year long as they used him much less as a quarterback and much more as a fullback/battering ram. None of that has changed over the past four years; not after winning two national championships, not since becoming the first sophomore to win the Heisman Trophy, and not since becoming a celebrity with a cult following all around the world, where several of his missionary trips have taken him. He is the perfect role model for our youth, a consummate team player and a beaming light of what used to be the norm and now is the exception. Definitely NOT according to Mel Kiper Jr. The critics want to poke at the fact that he is not a true QB, lacking pocket presence, a strong arm, proper mechanics, and the vision required to succeed in the NFL. While this may be true for now, Tebow has taken these criticisms to heart and devoted his Senior year as much to becoming a better NFL prospect at QB as he will concentrate on the ultimate prize of winning a third BCS Championship during his tenure. This past Spring I listened to Tebow go one-on-one with Mel Kiper, Jr., the NFL Draft guru whose word is believed to be as close to truth as there is in evaluating collegiate talent. Kiper Jr. respectfully examined for Tebow the knocks on him (those listed above), and Tebow humbly took those suggestions as part of a debate on Kiper Jr. incorrect opinion. As Kiper Jr. suggested Tebow would make a better split-end/tight-end in the NFL, Tebow disagreed outright and stated he will work hard to ensure he is a QB at the next level. Again the passion and determination showed up in his voice during the healthy debate. So why is this coming up now all of a sudden? Why are we discussing the draft position of a questionable QB in September, seven months ahead of the 2010 NFL Draft? Simple economics, that’s why. As mentioned earlier, Tebow happens to be from a city whose franchise is falling apart at the seams. Reports of players quitting on coach Jack Del Rio last year, added to the already diminishing season ticket holders and overall attendance figures, have led to reports that all of the 2009 season home games will be blacked out. I would appear the novelty of being a new NFL team as long worn off by now, especially after expectations were set so high at the franchise’s inception when they made the playoffs 5 years in a row after their inaugural season in 1995. With David Gerrard’s flashes of brilliance diminishing and an aged defensive unit starting to break down, the horizon seems bleak at the moment. Upon further review, the Jags could be in such desperate times that they may reach a bit and pay extra attention to the “value added” aspect of gambling a first round pick on a middle-to-late round prospect. There are enough first round busts floating around to argue that this wouldn’t be that much of a stretch to begin with, and perhaps by the end of the season it won’t be a stretch at all. The Jags passed up on taking a QB in this year’s draft, but who’s to say they shouldn’t next year? The real stretch is trying to compare this to the Cleveland Cavaliers drafting Lebron James, who is a once in a lifetime talent. In no way is Tebow in James’ league amongst his peers entering the professional ranks; LeBron was (and still is) head and shoulders above his draft class. But in terms of regional marketing ability in the northern Florida region, he definitely has the same cult following and mass appeal that could alter the state of the Jacksonville Jaguars franchise. ***My verdict: Jags, go ahead and take Tebow with an early pick… because if you don’t, someone else will!